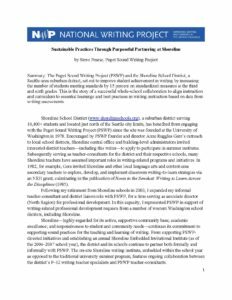 Summary: This article describes the successful, longterm partnership between the Puget Sound Writing Project and the Shoreline School District that focused on improving student achievement in writing. Following a model of a year-long, embedded invitational institute, P-12 teachers engaged in writing, working in writing groups, and conducting research on the teaching of writing. The resulting teacher-designed curriculum, aligned with NWP core principles, was posted on the district’s website for district-wide use by teaching colleagues. Ensuring that Syre student-writers would perform at higher levels when teachers act according to in-common understandings, agreements, and practices in the teaching of writing served as the plan’s rationale as well as its proponents’ essential assumption. Informed by their individual involvement with one or more PSWP or other writing project programs (e.g., invitational summer institutes and/or open institutes), lessons learned through shared teaching materials and instructional approaches, and grade-level team discussions regarding student-writer strengths and weaknesses, Syre teacher-leaders and their principal framed a school improvement plan (SIP). As it turned out, the plan’s conceptual framework naturally, although not intentionally, corresponded with central National Writing Project principles.